To step outside your comfort zone in the kitchen may mean stepping away from the recipe books and creating food using your instinct and experience. 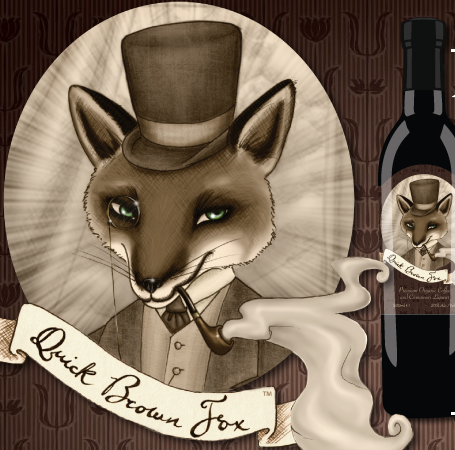 Last month at the Otago Farmers Market, Quick Brown Fox creator Arjun Haszard challenged me to come up with a recipe to complement his "organic-coffee liqueur with a clever hint of cinnamon in its tail". If I hadn't been reading "The Flavour Thesaurus" by Niki Segnit, I may have steered away from such a challenge. A review from Observer Food Monthly I feel sums up Niki Segnit's "The Flavour Thesaurus", "Something different for your pal with a fridge-full of cookbooks. A forensic yet fund exploration of flavour combinations and why they work, from the usual (lamb and min) to the unlikely (watermelon and oyster). Niki describes herself as a confident home cook. She discovered she would always rely on recipe books rather than cooking by instinct as her grandmother or mother could do. Today we do have a far greater variety of food ingredients to choose from than our mothers had, but has this caused us to rely on recipes rather than go by traditional knowledge and instinct? 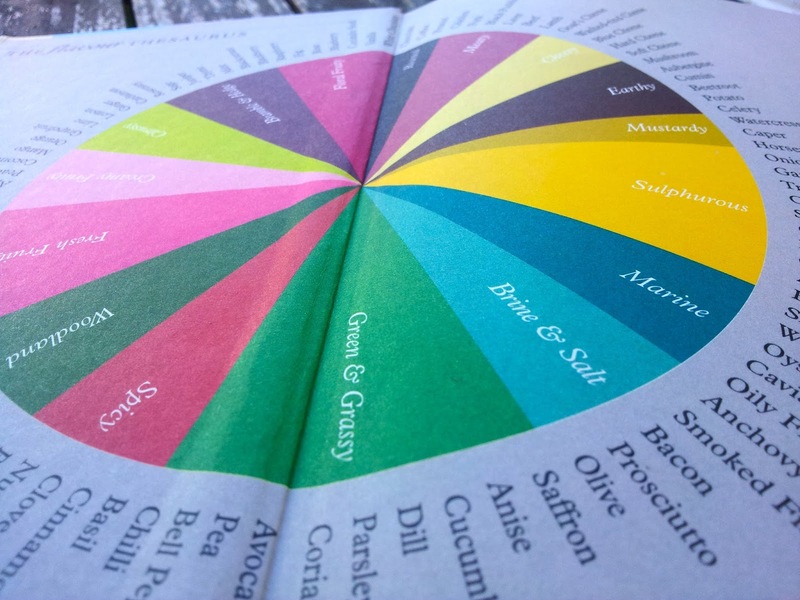 After a massive amount of research Niki has come up with a unique guide on flavour combinations shaped into a colour wheel of flavours. She limited herself to 99 foods and the wheel is made up of 16 flavour categories: Fresh Fruity, Bramble and Hedge, Marine, Brine and Salt, Green and Grassy, Earthy, Floral Fruity, Citrussy, Creamy Fruity, Roasted, Meaty, Cheesy, Mustardy, Sulphurous,Woodland, and Spicy. If you want to begin to experiment more in the kitchen then this is an excellent book to have at your side. 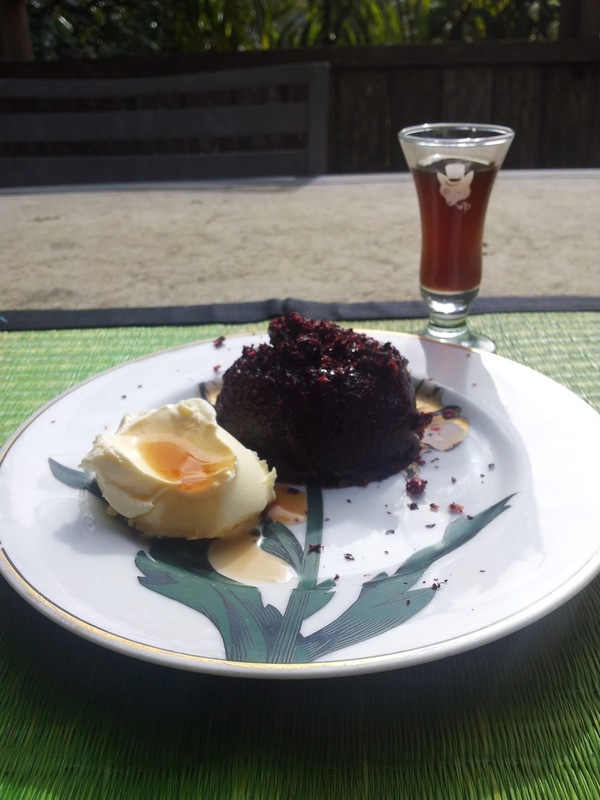 Coffee and Blackcurrant: Niki Segnet writes on Coffee and Blackcurrant: "A mysteriously good pairing that often crops up in wine tasting notes". That gave me an idea... I would use this signature fruit of the south to create a sorbet flavoured with the QBF liqueur. Making sorbet has become a bit of a passion with me - no fruit is safe from an experimental sorbet. 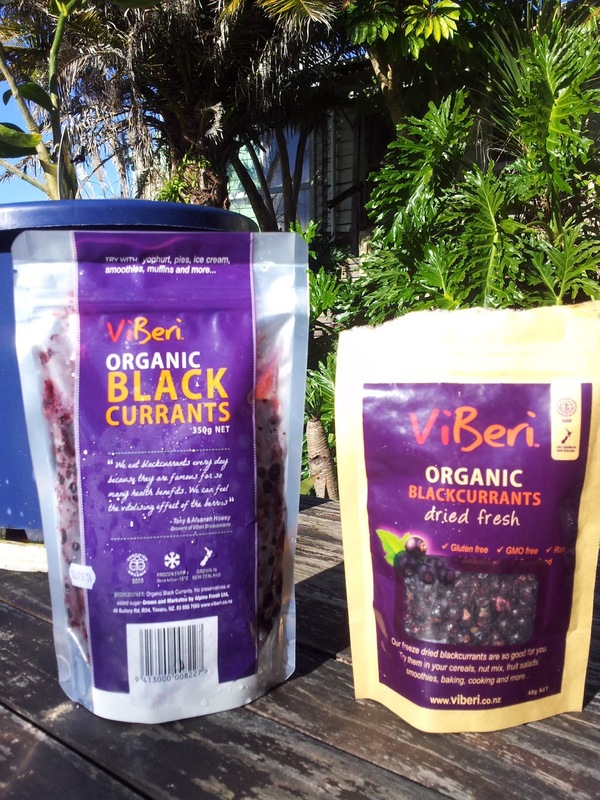 Usually I have a giant bag of blackcurrants in my freezer from the summer harvest but now living in Auckland I have to buy them. 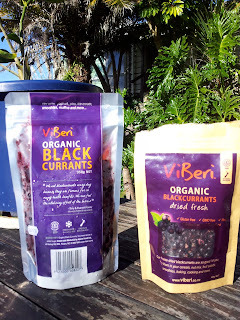 I couldn't go with 100% blackcurrants as a 350g bag cost me around $7. Step up the apple... the great flavour extender to make up the bulk I needed and the bonus of added natural sweetness. 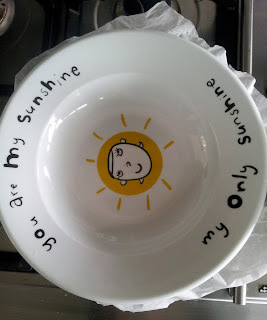 because it was used to flavour many puddings. I first make a sugar syrup for 1 kg of fruit - 350g of sugar to 500ml of water adding a cinnamon stick. 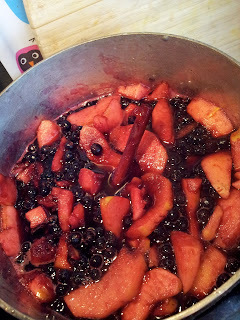 I add the apple first as it takes longer to cook, then the blackcurrants. I peel the apples to make the sieving process easier and cook it until the fruit is soft and can be easily pureed. As I have peeled the apples I could just put it all in the kitchen whizz to puree instead of sieving. If I was using my home picked blackcurrants with stalks included I would sieve rather than puree. To the resulting puree add 3 Tbsp of QBF liqueur - always add the liqueur a little at a time and taste. You want to get the flavour of the coffee but not overpower the fruit of the blackcurrant. 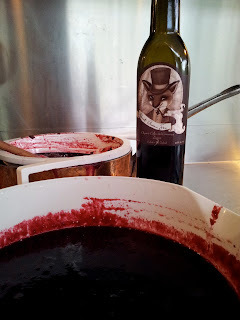 The liqueur ensures the sorbet will remain soft and not ice up. Pour this puree into a plastic container and freeze. The next morning get it out and whizz it up with a food processor or a stick blender. I have found the stick you use to puree soups is the best for breaking up and creaming the sorbet. Put back in the freezer and it's ready to eat that night or the next evening. You can serve the sorbet on it's own as a palate refresher in between main and dessert, or add creme fraiche or vanilla ice cream with a touch of QBF liquor and a shot of the liquor as a dessert offering. The blackcurrant crumbs I sprinkled over the top of sorbet to give extra bite. They are freeze dried blackcurrants crushed with a mortar and pestle. 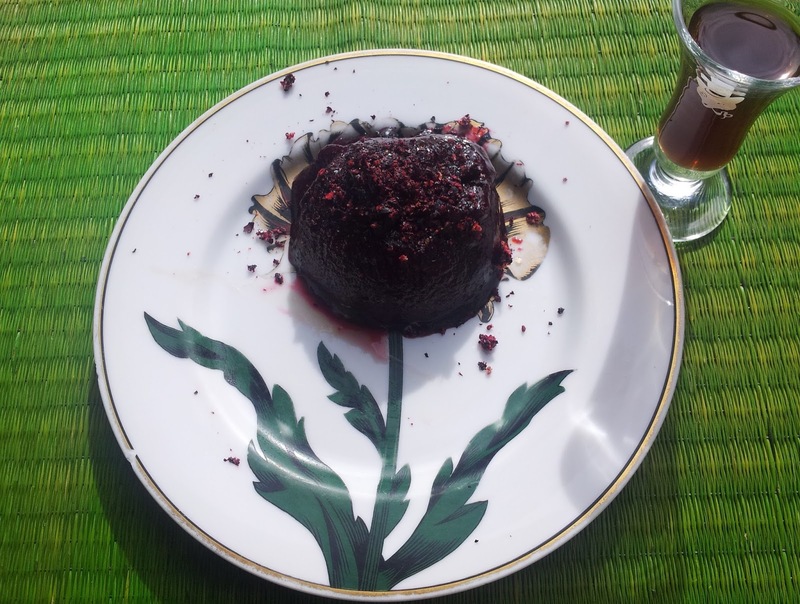 These amazing taste explosions are produced by an enterprising couple from Pleasant Point in South Canterbury and I used their frozen blackcurrants for the sorbet (there are no stalks in their frozen blackcurrants). first commercially grown organic blackcurrants. I decided to offer a recipe from fruit in season right now. 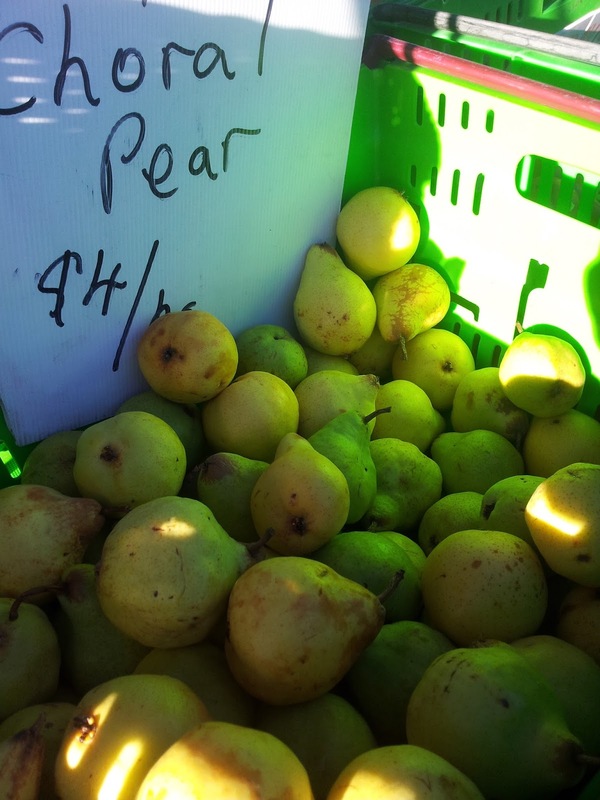 I had some beautiful pears I purchased at the market and felt they would be great candidates for poaching in make something that is in season now using QBF liqueur. I first made up a heavy sugar syrup of 3 cups of water to 1.5 cups of sugar and added a cinnamon stick. You can use less sugar but I wanted to make these pears syrupy and rich to contrast with the bite of the blackcurrant sorbet. I usually poach them in a lighter syrup of 3:1 or 4:1 depending on the natural sweetness of the fruit. Bring to the boil and then place the whole pears peeled into the pot. The problem with poaching whole fruit is that they tend to bob up to the top. I learnt a trick from Australian chef Stephanie Alexander. Place a piece of baking paper over the top of the pears in the cooking pot, and put a plate on top to keep their heads under water. They don't go brown like those that are cooked exposed to the air. 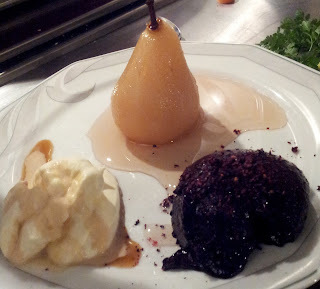 Keep a watch on the fruit - it may only take about 8 minutes for the pears to cook and you want them soft but not mushy. Test with a fine scewer to see if they are cooked all the way through. 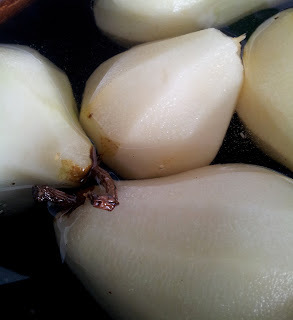 Take out the pears carefully and reduce the cooking liquid until it thickens to give that lovely rich syrupy feel. Once reduced add the liqueur. I just put in a shot, but once again test and if you feel it needs more then add more. 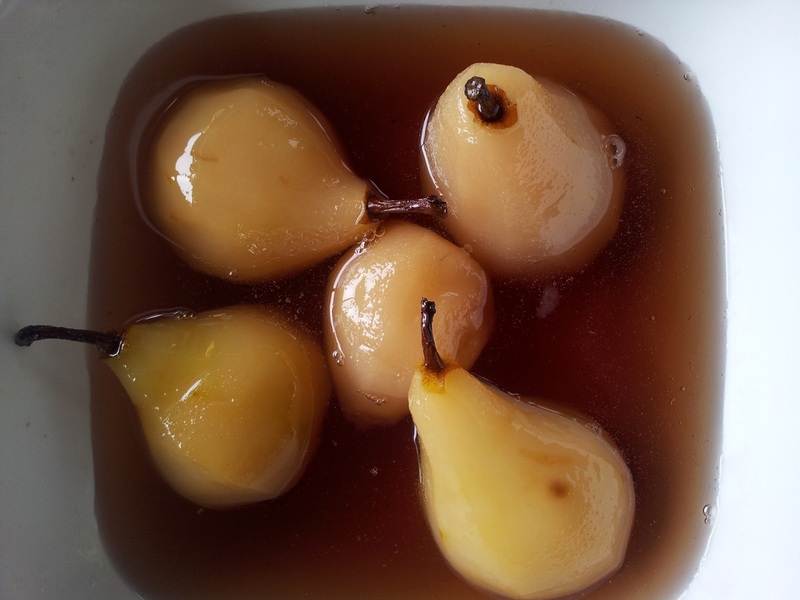 Pour the thickened syrup over the pears and let them sit and soak in those QBF flavours of coffee and cinnamon. 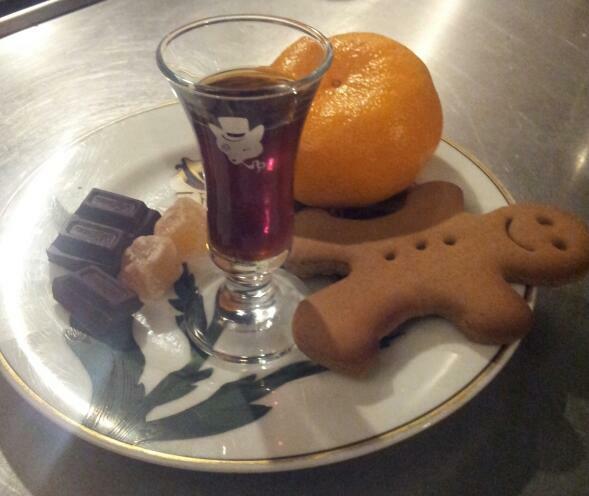 Or you can just enjoy the coffee liqueur with a selection of flavours from the kitchen pantry. ginger. Dark chocolate is the perfect match for coffee and for freshness a touch of citrus...a perfect ad lib dessert. To create something without a recipe book is a little like driving around Auckland without GPS. It can mean some errors in the beginning, but the end result will be increased confidence based on decisions you have made by observation, rather than just being told what to do. This confidence will allow you to open your fridge and make a meal with what is available. You do have to have a basic knowledge of cooking and I started experimenting by simply replacing ingredients in recipes with a vegetable or fruit that I had a plentiful supply of. 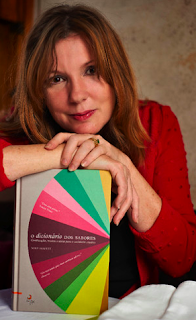 Niki Segnit's book has given me further understanding of food flavours and the confidence to take on the challenge that Arjun gave me that morning at the Otago Farmers Market.